Announced by Andy Rubin in May, the Essential Phone - one of this year's most interesting handsets - hasn't been released yet. However, Essential started accepting reservations for the smartphone right after announcing it, and now the company knows when the device will finally start shipping. 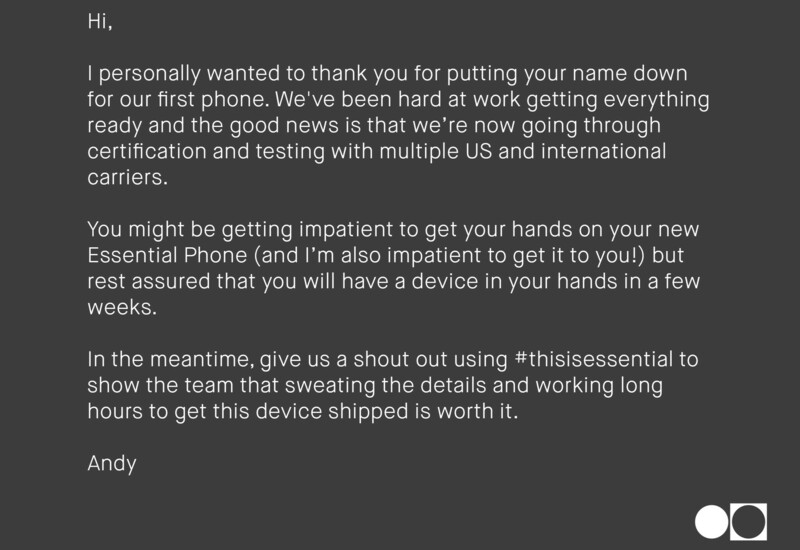 Andy Rubin himself sent out an update today, informing the world that customers who've registered to buy the Essential Phone should have the smartphone in their hands "in a few weeks." ourselves received an email with the very same lines seen in the image above. Normally, "a few" should mean no more than 3 weeks, so we're expecting the new handset to arrive before mid-August. Priced at $699 unlocked, the Essential Phone is obviously not on the cheap side. Still, its features pretty much justify this price, as what we're having here is a handset capable of standing next to any other high-end phone currently on the market. With its 5.7-inch, 1312 x 2560 pixels display that has almost no bezels around, the Essential Phone certainly stands out. Its 8 MP front-facing camera also stands out, as it's protruding into screen territory, but at least Essential found an extra use for that bulge, including an LED notification light next to the camera. In addition to being offered unlocked (compatible with all US carriers), the Essential Phone is going to be sold via Sprint, although there's no word on exactly when this will happen. Have you reserved an Essential Phone, or do you plan to purchase one anytime soon? Let us know in the comments below! nice try. You do more advertising for apple than apple does. So iPhone 8 is already out? Did u buy one? Stupid. While I did put my name on the list, the One Plus 5 came first and for $479 for the 6GB model, you really cannot beat the Value. You have USB Type C. The problem would be you can not listen to music and charge the phone at the same time. Definitely interested to see reviews for this thing... being a current iPhone user, I'm not looking forward to paying upwards of $1,000 for a device... that's just insane... also waiting to see what the Pixel 2 looks like! I’m buying it. The front aesthetics do not bother me and I like the vision overall, especially with future accessories. The vaporware is finally going to ship. 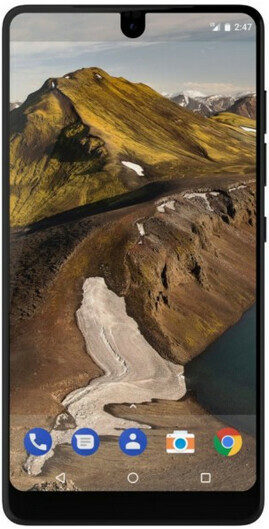 The device that has yet to be reviewed, and no one knows really anything about it, other than what Essential has told us. I hope this delay (whether real or created by Essential themselves) means the device will not have any show stopping issues.